Yes…..It’s a device where chalk is placed in each holder, then drawn across a blackboard to create a music staff. 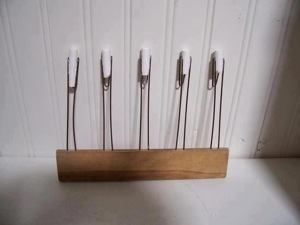 My teachers in grade school used one of these to then write music for us to sing. Pretty cool…..I haven’t seen one of these in years! I see it is used to make lines in teaching cursive. Don’t think they teach that anymore.